We’re clean eating! Not sure why I put an exclamation point there. I know it’s not exciting, or comforting, or oozy sloozy melty creamy lusciousness, but I have to say; this meal is ding dong good. It FEELS good to eat. It’s light, and gives you a skip in your step. It makes your eyes feel brighter. (Do you ever feel that way? I swear anytime I eat insanely healthy I feel my eyes getting whiter and brighter. I have issues.) Aaaaand it’s the new year with all the being-better goals and resolutions and stuff blah blah blah so here we go. I think about turnips a lot. 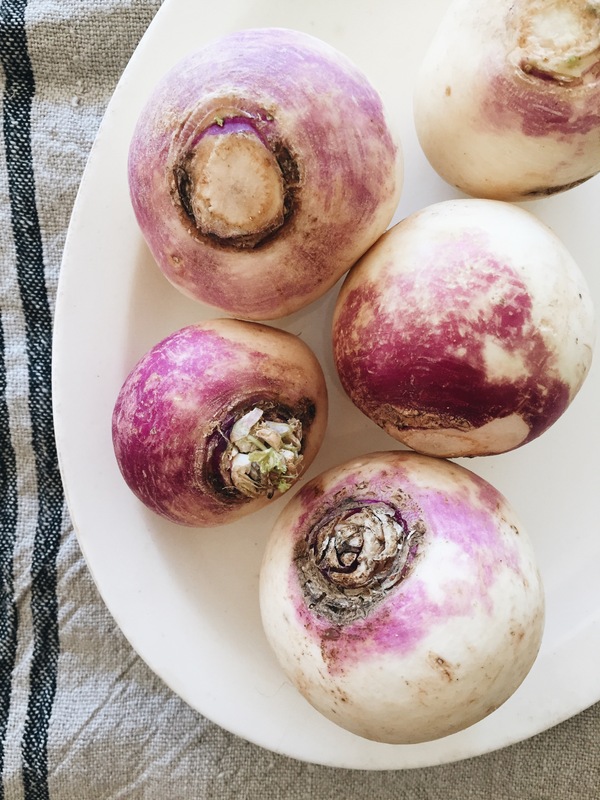 My heart and soul will ALWAYS be devoted to potatoes, but listen to this::: I have found that turnips make a pimp sub for roasted potatoes, if you’re looking to lessen carbs, or just shake things up a bit in your life! And it’s 2016. It’s overdue for some shakin’. 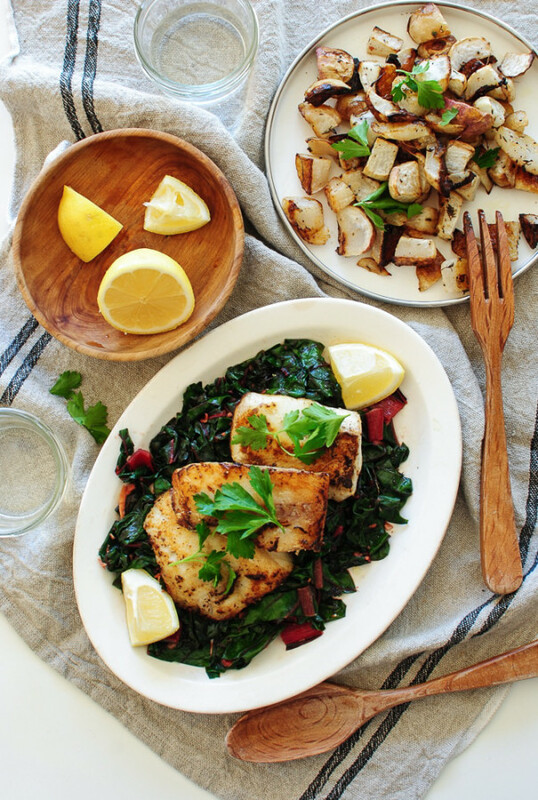 This meal is basically going to consist of three things; your lean protein (ze seared cod), the dark leafy greens (ze garlicky swiss chard), and your veggie (ze roasted turnips with thyme). You know, I hardly ever make meals with the main meat, and the two sides. I grew up eating like that, but I tend to make things in one pot, or one pan, or one skillet, or one dish, or one whatever. But it’s fun to go back to my childhood ways of eating! *see shaking things up a bit in 2016. 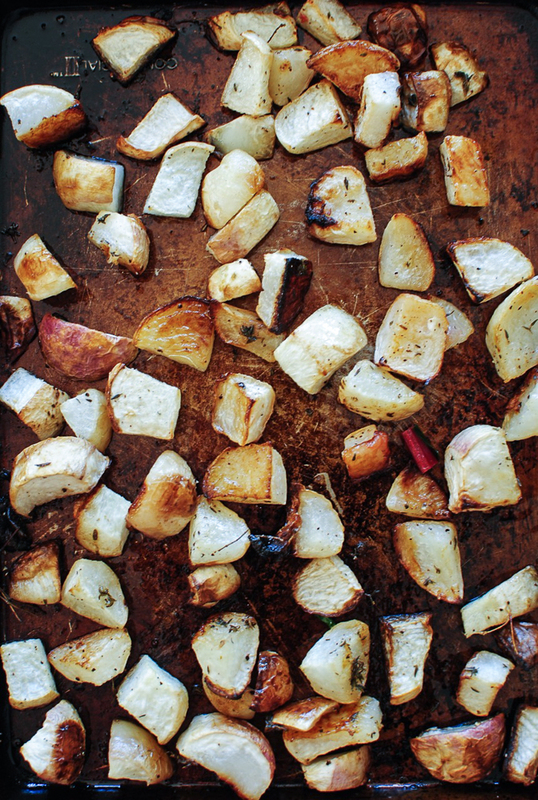 Roast the diced turnips with fresh thyme and you will blubber like a baby with glee. Also, I’m trying my hardest to resist a roasted roots joke. You know, RU(oa)sted root? The band? From the ’90s? Send Me On My Way? Oh you do? Okay. That’s all. And lastly, the seared cod! However, it cooks in butter, so we’re all still greatly winning in the game of life. 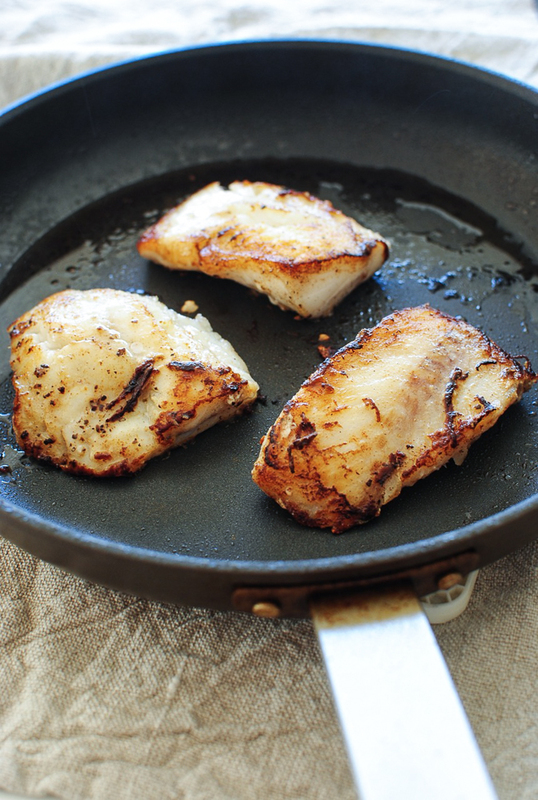 I chose cod because I like the sturdy, meaty texture. I think it pairs well with the silky chard and sweet turnips. You guys, I’m telling you, this little food match up be like YEAH. Place the diced turnips on a baking sheet, and drizzle with a Tbs. of oil. Sprinkle with the thyme leaves, and season with salt and pepper. Roast for 50 minutes to an hour, until tender and gorgeously browned. Heat the butter and remaining Tbs. of oil in a large skillet. Season and fish on both sides with salt and pepper and sear on one side for four minutes. Flip and sear another 3 minutes. Remove the fish and let rest. Back in the pan, add a tiny bit more oil if needed, and the minced garlic. 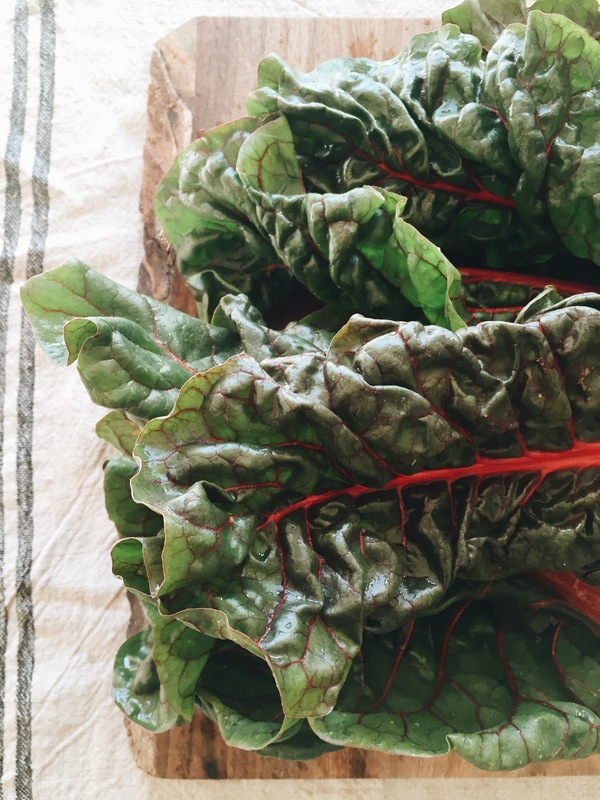 Bloom for 30 seconds, then add the swiss chard and toss to coat with the oil, slightly wilting. Add maybe a Tbs. of water to help wilt it along. 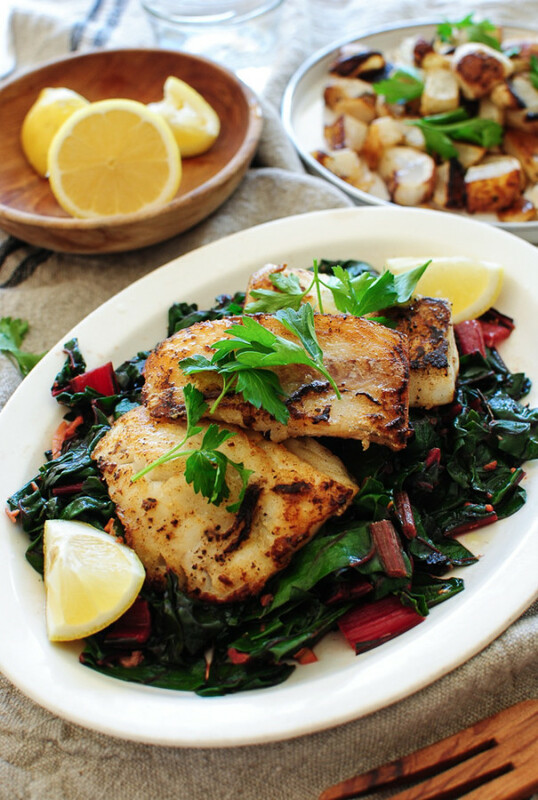 Serve swiss chard on a platter topped with the seared fish and roasted turnips. Squeeze a good bit of lemon juice over everything! Ugh. Where is the recipe itself? 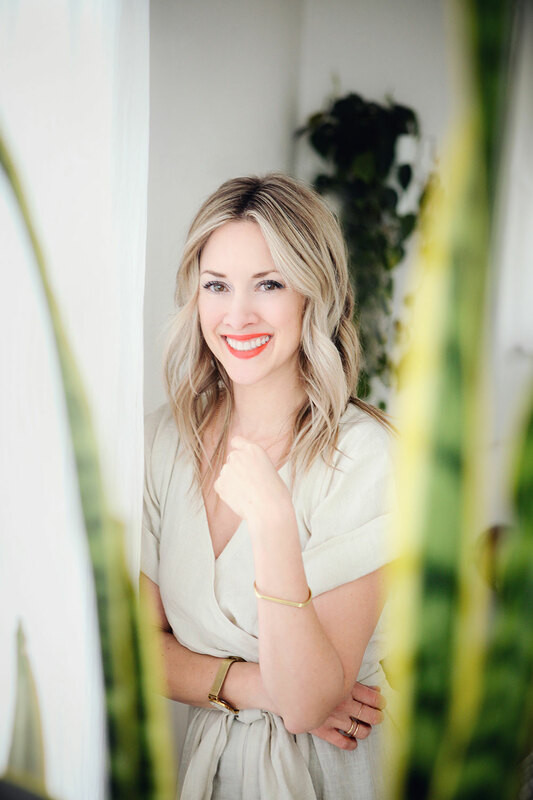 Are you viewing it on your phone? See, we just updated my recipe plugin, and I can see it on my computer, but I'm having issues on my phone. I'll let my gal know and we'll get it figured out! But so far I can see it on my computer. I hope that helps. Stand by! Oh, this combination seems just so right! I love fish but I have never paired it with turnips. 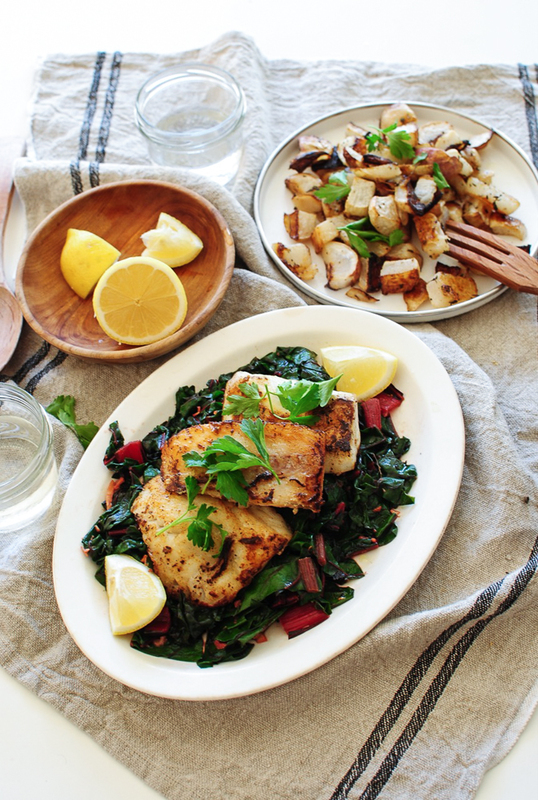 Do you think that turnips will go well with other kinds of fish too?